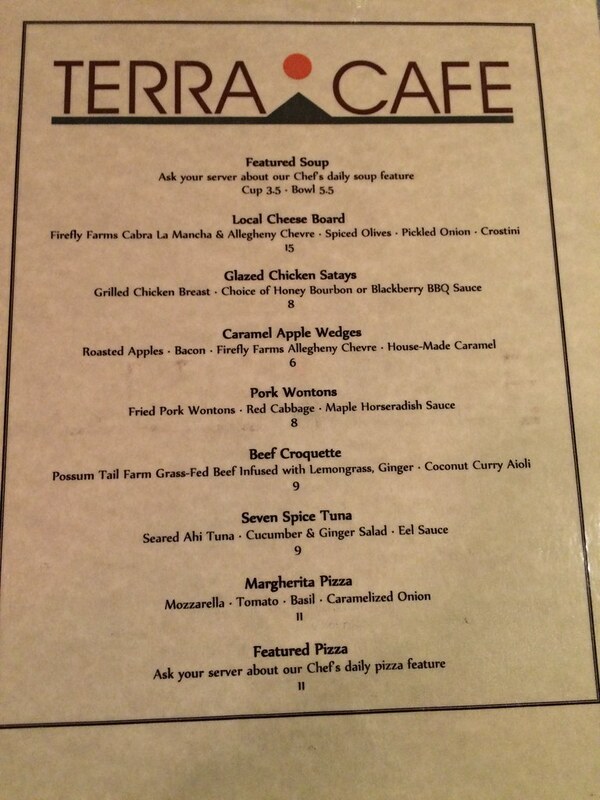 Terra Cafe recently announced they will be expanding their hours to include dinner service (EDIT: Hours are 5-9 p.m. Thursday, Friday, and Saturday). They're serving "tapas" or small plates - meaning, well, each plate is really small, and you're meant to order more than one and share them with the whole table. I don't mind that idea (because I like to try a little of everything), but it can definitely add up in cost fairly quickly. 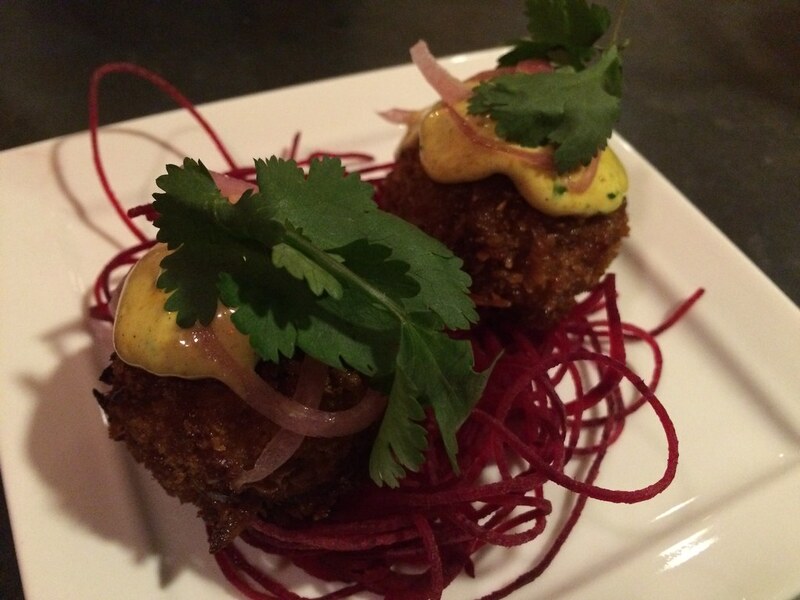 After I was seated (no ordering at the counter here), I ordered the beef croquettes, which were two round Possum Tail Farm grass-fed beef infused with lemongrass, ginger and coconut curry aioli. These were pretty good. They were $9 for two small round balls with some beet noodles underneath. But they were good. I am a huge fan of the light flavor with the lemongrass. And the aioli was tasty, too. I really wish it was the croquette sandwich. I love that thing. To get the same equivalent of a sandwich, I'd probably have to order three plates. My friends ordered the margherita pizza (which apparently apparently Sargasso makes their pizzas) and the chicken satay. Both I thought were OK, but not great. I'm glad at the last minute I thought to add their pork wontons. They came with red cabbage and a maple horseradish sauce. These were $1 cheaper at $8, and there was a bit more substance to them. 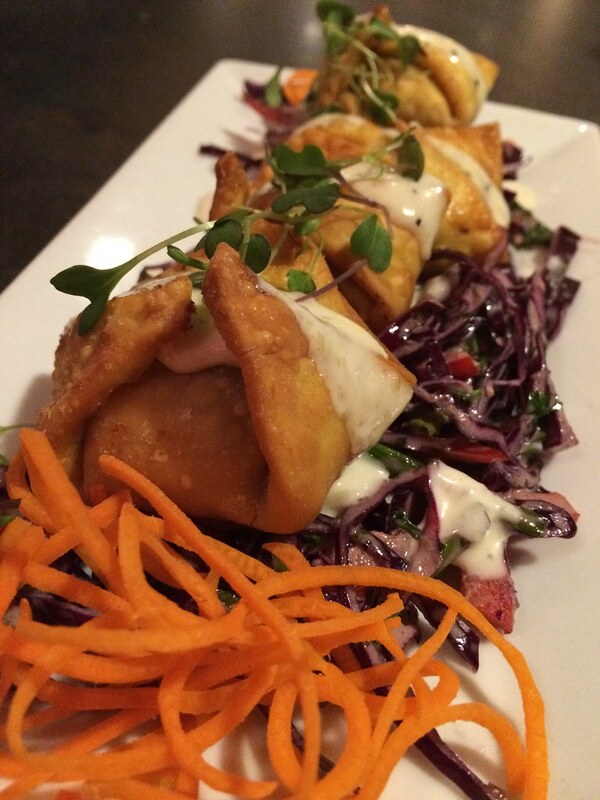 Four fried pockets filled with meat. I think they were tasty for the most part, but the meat could've used some more flavor. The horseradish sauce was a nice touch. They also have a very nice dessert menu (in addition to the goodies in the case) that complements their dinner menu. You can get three mini desserts for $10. That is perfect. And a crazy good deal, too. 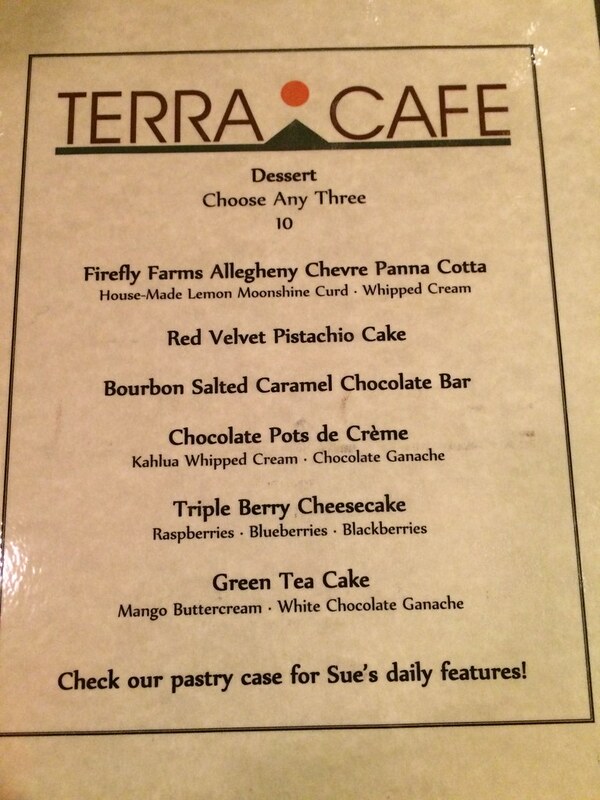 I ordered the Firefly Farms Allegheny Chevre Panna Cotta, the bourbon salted caramel chocolate bar and the triple berry cheesecake (raspberry, blueberry and blackberry). The panna cotta was very tasty, and I love the little touches like a fresh lemon. The caramel chocolate bar I thought for sure would be my fav (caramel, duh), but whew you could taste some bourbon/bitterness in the chocolate. And the cheesecake was sweet and whipped. They were all quite lovely, and I was impressed with the presentation, the quantity and the quality. Super pleased with the desserts. It's a little on the pricey side for me, for what you get. 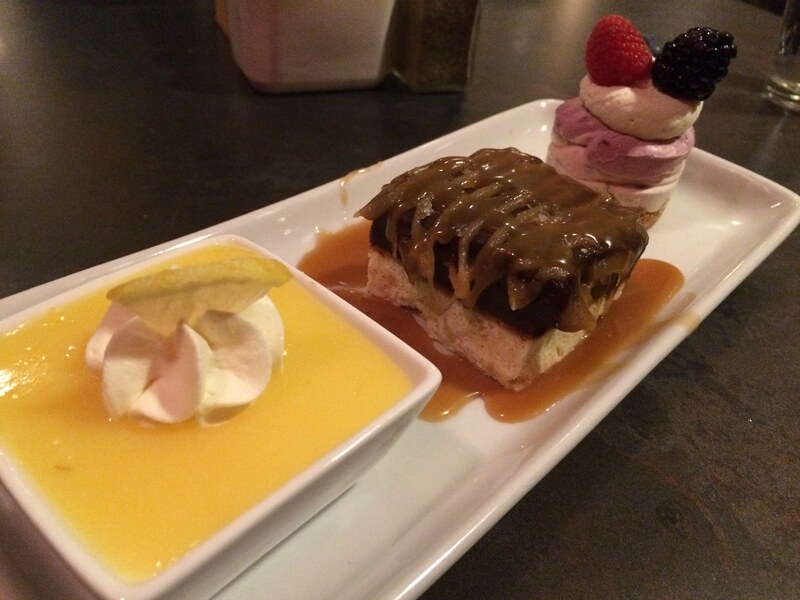 Dessert is totally worth it. But I spent about $20 for the two croquettes (which are about the size of golf balls) and four pork wontons. And it was all good - but not crazy great. I'm looking forward to seeing what else they add to the dinner menu and if they'll be doing dinner specials! Something to keep an eye out for. No grade because it's just an update =] They've already been put through that ringer.